In case Schiaparelli’s crash-landing left you thinking the European Space Agency’s ExoMars mission was a bust, rest assured it wasn’t. The mission’s scientific workhorse—its Trace Gas Orbiter (TGO)—is performing beautifully, as evidenced by the first images and splashes of data ESA has now received back from the Red Planet. In keeping with ExoMars’ goal of discovering signs of life, the TGO’s agenda is to produce a detailed inventory of rare gases in Mars’ lower atmosphere. These include water vapor, nitrogen dioxide, acetylene, and most importantly, methane, which is broken apart by sunlight. If methane is present in Martian air, something—either a biological or geological process—is resupplying it. The TGO is also equipped with state-of-the-art imaging equipment. If it does sniff something interesting, ESA will take detailed photos of the corresponding spot on the surface, so that a future rover can pay a visit. Last month, the TGO was captured by Mars’ gravity into a highly elliptical orbit. It’s going to spent the next year making that orbit circular before the real science begins, but in the meanwhile, ESA has plenty of time to test and calibrate the spacecraft’s instruments. Thanks to TGO’s efforts over Thanksgiving, ExoMars has now produced its first glimpses of Mars’ atmosphere, a couple of lovely aerial photos and one 3D reconstruction of a surface feature, Noctis Labyrinthus, from a pair of stereo images. 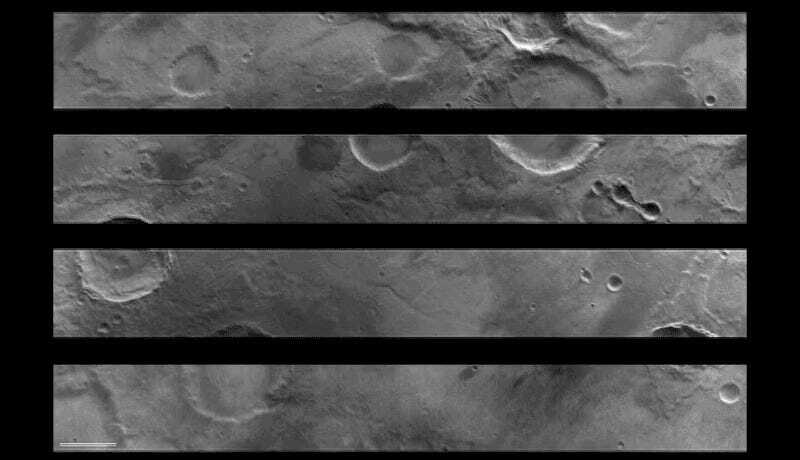 It’s worth noting that because the TGO was just 146 miles (235 km) above the surface when these images were taken during a recent approach, they’re some of the closest images the orbiter will capture, period. By this time next year, the spacecraft will be homing in on its science orbit, a fixed altitude of 250 miles (400 km). Hopefully by that point, ESA will have made the necessary corrections to ensure that the 2020 ExoMars lander doesn’t suffer the same fate as Schiaparelli.